Blackberry has chosen to partner with NFC mobile tech specialist Crosscliq to demonstrate the benefits and convenience of NFC. 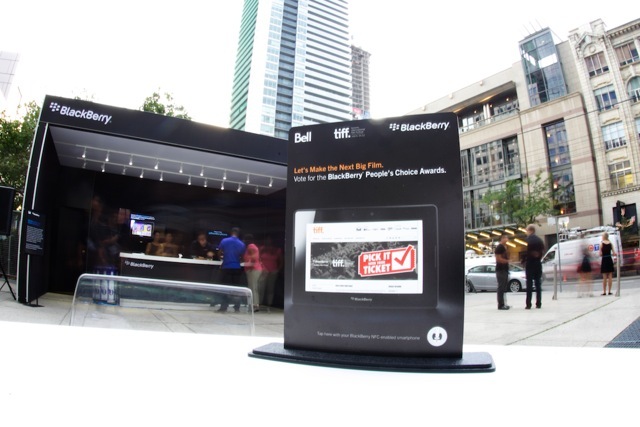 This year’s Toronto International Film Festival (TIFF) saw the companies join forces to deliver an experiential mobile opportunity for guests of the festival. The Blackberry and Crosscliq demonstrated additional applications for the technology beyond payments. Using NFC-enabled devices, Blackberry Ambassadors enabled guests to vote for their favorite film, download the Official TIFF interactive film guide and other BlackBerry entertainment apps and enter the Bell and BlackBerry trip for two to Hollywood contest— all with the tap of an NFC-enabled smartphone. Crosscliq brings a different perspective and use of NFC to the table— marketing. Crosscliq offer its clients an end-to-end solution that is practical in its use and handling of data. Crosscliq leverages proprietary software to quickly deploy print-to-mobile and screen-to-mobile campaigns using NFC tags— passive and active— QR codes and Apple’s recently announced Passbook.